U23 Worlds bronze medallist Kristoffer Skjerping will turn professional in 2015. The talented Norwegian has signed a two-year contract with the merged Cannondale-Garmin team and is expected to do all the major cobbled classics in his debut season. 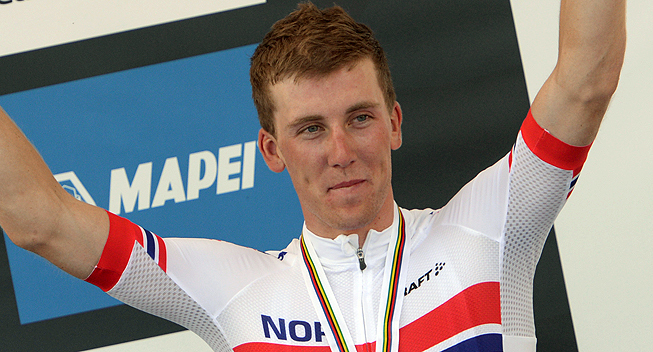 Kristoffer Skjerping, the bronze medallist from the U23 Worlds road race, will join the Garmin-Cannondale team. He confirmed the news at a press conference today. "A lot of teams have contacted me and shown interest. Sky was the first to do so and my agent had a meeting with them. For a long time, Lampre were also a possibility and they contacted me again after the Worlds. On the day when I won bronze in Ponferrada, [Garmin sports director] Andreas Klier called me. I have also talked to [Garmin manager] Jonathan Vaughters. They appreciate the fact that I chose them. I am looking forward to the challenge." "They want me to put me on the roster for the classics. Those are the races that I will focus on. I will do almost all the classics. Both Sky and Garmin are big teams, but I had no doubt," Skjerping tells procycling.no. The Team Joker rider also had offers from Lampre-Merida and Bretagne. Team Cult Energy also showed interest in the youngster. Skjerping has had a great season. At the beginning of the year, he was second in the U23 Tour of Flanders and he won a stage in the Tour de l'Avenir a few weeks before taking third at the Worlds. At Garmin, he will be part of the classics roster. "The plan is that he will do Paris-Roubaix and the Tour of Flanders in his debut season. It is a big advantage for him to get the chance to ride them without being under any kind of pressure," Joker manager Gino Van Odenhove tells Procycling.no. "He will be most visible in the classics. That's where his future lies but he can also do smaller stage races and contest some bunch sprints. The best would be to focus on the Northern classics though," Van Odenhove adds. Skjerping also hopes to show himself in the finales. "I know that I am fast in a sprint from a small group. I hope to get the chance to show that," he says. In recent years, Tyler Farrar has been the main sprinter on the team but the American will join MTN-Qhubeka. As Elia Viviani is set to join Sky, there may be room for Skjerping to test himself in the sprints. Skjerping has signed a two-year contract with the team.